1) The Guardian leak 5) Tracking down PRISM 9) Is there a back door? Guardian blogger and former lawyer Glenn Greenwald reports that the NSA has gotten a secret order from the Foreign Intelligence Surveillance Court that allows it to collect data about phone calls made by “millions of customers” on the Verizon network: location data, time and other identifying info about the call — everything except the actual content of the calls themselves (the Guardian has a background piece about what kind of metadata is available with such an order). Other stories that follow the Guardian report quote anonymous sources saying the Verizon court order is a renewal of an order that has been in place for some time, and add that other telecom companies such as AT&T are also involved in similar programs. Greenwald notes in his story that the NSA started a program of bulk collection of telephone, internet and email records in 2001 under President Bush and this later caused controversy when it was reported in 2006 that the NSA had been saving all of this information and was analyzing it to try and detect terrorism. Information-security experts and other industry watchers note after Greenwald’s story is published that the NSA and other government agencies have had these kinds of abilities for years thanks to laws such as the Protect America Act and the FISA Amendments Act. ProPublica has a roundup of what the government can find out about you and your behavior without a search warrant, and security expert Bruce Schneier says that what we don’t know about the government’s surveillance programs is even more frightening than what we do know. Meanwhile, our Stacey Higginbotham wonders whether the NSA story will be a wakeup call about the power of big data, while Derrick Harris looks at how the security agency and other government entities analyze the vast amounts of information that come from such programs. Freelance journalist Joshua Foust argues that the NSA revelations won’t cause most people to change their behavior — including their habit of voting for politicians who enact the kind of legislation that permits such surveillance — because they simply don’t care enough about the issue. Some experts said the kind of data the NSA is getting can be very powerful when it comes to finding patterns of behavior, but research from the Cato Institute says that even mining large amounts of data can turn out to be not that helpful when it comes to catching terrorists. Within hours of the Guardian story appearing, the Washington Post reports that it has been leaked an internal slide presentation from the NSA that describes a program it calls PRISM — which involves the collection of email and other personal data from internet companies including Google, Microsoft, Facebook, Apple and Yahoo. According to the Post report (and a subsequent Guardian report based on a similar leak), this program has been underway since at least 2007, and involves what one NSA slide refers to as “data collected directly from the servers” of the companies named. 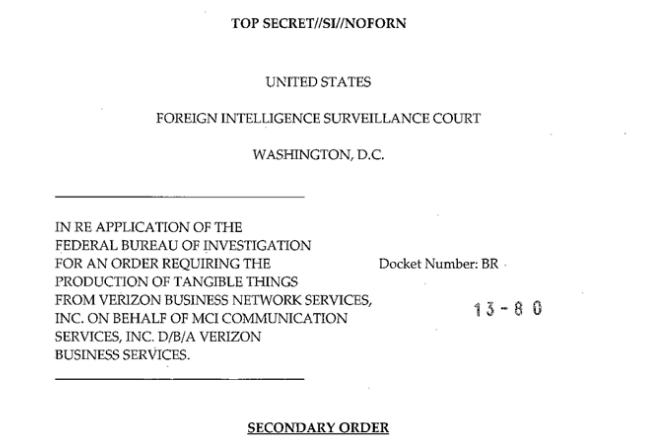 All of the companies who are reportedly involved in PRISM (which refers to them as “partners”) deny any knowledge of such a program, and say they only provide data when forced to do so by court order, and that they have no “back door” systems that would allow the NSA to do what it claims to be doing. These denials are met by widespread skepticism, and many observers — including TechCrunch founder turned VC Michael Arrington — wonder why insiders working at the tech giants allegedly involved in the program wouldn’t have leaked the information earlier. Some tech-industry observers say the denials from internet companies may be true, because they aren’t convinced the companies in question would even have to know about the NSA’s collection practices in order for them to work. The original Washington Post story is updated early Friday to note that it’s not clear whether “direct access” to the servers of those companies would be required, and quotes from another leaked document that says the program allows NSA officers to send “content tasking instructions directly to equipment installed at company-controlled locations,” which could mean boxes installed at ISP switches. Several sources note that former AT&T employee Mark Klein revealed in 2007 that he had come across documents that showed the telecom company installed equipment — using glass prisms as “splitters” — that allowed the NSA to make a copy of the data stream coming from the AT&T network and send it to data-storage centers operated by the security agency. This was alleged to be part of a larger program that stored telephone calls, emails and other internet activity for the government and had been underway for years. Some network analysts speculate that the NSA may be making use of equipment installed at CDNs (content delivery networks), which handle much of the data traffic for companies like Google and Yahoo. Laws passed in the U.S. require equipment makers such as Cisco to build into their products a way for law enforcement officials to tap into the streams they carry, and the NSA could be searching those streams directly instead of copying or storing all the data itself (since the cost of the program is a relatively cheap-sounding $20 million, according to the Post leak). A search for entities that might be involved in the NSA program turns up software from a relatively secretive startup called Palantir — which has been funded by the CIA through its investment arm — that happens to be named PRISM. According to descriptions of the software, it allows clients of Palantir to sift through massive amounts of data and find patterns quickly. Not wanting to be left out, the secretive activist group Anonymous released some classified documents that refer to Defense Department information technology — but they appear to be mostly jargon-filled descriptions of the department’s IT infrastructure, with little or no connection to PRISM or any NSA-related data collection practices. The ripples spread outside the U.S.
As our man in Europe — David Meyer — noted in a couple of posts Friday morning, the repercussions from the PRISM and NSA revelations are being felt in Europe as well, with some critics calling for changes to the so-called “Safe Harbor” program, which allows data about EU citizens to be stored by non-EU companies. And the Guardian has reported that the U.K. government appears to have been getting information via the PRISM program, which was designed to focus on the communication activity of non-U.S. residents (since U.S. law still technically prevents the government from spying on its own citizens without a warrant). Facebook co-founder and CEO Mark Zuckerberg posted a statement about PRISM on his Facebook page late Friday, saying he wanted to respond personally to the “outrageous press reports” about his company’s involvement in the surveillance scheme. In language very similar to the Google denial, Zuckerberg said the network has not been part of any program to give the U.S. government “direct access” to its servers. Does the NSA even need a back door? Christopher Mims at the Atlantic business site Quartz quotes NSA veteran and whistle-blower William Binney — who was part of a group that asked the Defense Department to investigate the NSA in 2002 — saying the security agency could probably get its hands on about 80 percent of the web traffic that passes through the U.S. without even having direct access to the servers of companies like Google. That’s because the NSA has access to at least one of the largest communications hubs on the continent, as described by the Electronic Frontier Foundation. In other words, “companies were essentially asked to erect a locked mailbox and give the government the key” and Facebook actually built such a system, the NYT story said. Declan McCullagh at CNET explained in a post that according to his sources, all that the PRISM process does is automate something that is required under FISA (the Foreign Intelligence Surveillance Act) — so court orders are given to the tech companies and they have simply made the process of handing over that information easier. First tech companies claimed they didn’t know anything about PRISM and weren’t supplying data (or at least not direct access), and now the story some sources close to those companies are telling is that they set up portals or some other method of complying with FISA requests in order to “protect the innocent,” according to a post at TechCrunch. The Guardian has responded to criticisms of its original description of PRISM and the whole notion of “direct access” — as well as the repeated denials from Google executives and others that this has been taking place — by posting another slide from the leaked NSA presentation. 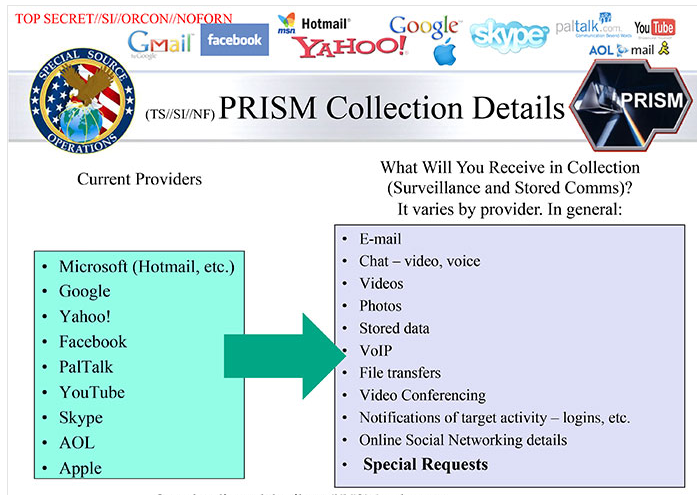 While some have speculated (as mentioned above) that PRISM could mean simply sucking data from ISP equipment, the NSA slide contrasts this method of getting data with PRISM’s, which it describes again as “collection directly from the servers” of the companies mentioned. In another bombshell, the Guardian revealed the identity of the whistle-blower who sent them the leaked documents about PRISM and the NSA surveillance program: he is Edward Snowden, a 29-year-old former technical assistant at the Central Intelligence Agency, and he is now living in Hong Kong and expects he will “never see home again.” He said his family doesn’t know about his activities, and that he fully expects to be charged and potentially face jail time for his actions. In a post written for The Atlantic magazine, James Fallows said that the most frightening and important part about PRISM and the rest of the NSA surveillance activity revealed by Snowden is that it is all legal under the Foreign Intelligence Surveillance Act and other legislation. Fallows — and others such as Talking Points Memo founder Josh Marshall — raised some question marks about the wisdom of Snowden’s choice of Hong Kong, which is still part of China and therefore not particularly open to harboring whistle-blowers. However, according to some experts in the law, Hong Kong might be a good place to seek asylum because of a loophole that could allow Snowden to remain there indefinitely. Icelandic MP Birgitta Jonsdottir, an early supporter of WikiLeaks and of freedom-of-information laws in general, told Forbes magazine that she plans to try and get her country to offer Snowden political asylum. But observers of the political scene in Iceland say this might be more difficult than it would have been in the past, since the new Conservative government is seen as more friendly to the Obama administration. Daniel Ellsberg — the man who leaked the famous “Pentagon Papers” in 1971 and revealed that the government had been lying about the Vietnam War — said in a piece written for the Guardian that Snowden’s leaks give the United States a chance to “roll back what is tantamount to an executive coup against the U.S. constitution.” Ellsberg said that Snowden’s revelations were the most important leak in the history of the United States, including his own. Meanwhile, David Kirkpatrick — author of the book “The Facebook Effect” — asked whether the secrecy and privacy invasions involved in the PRISM program might impair the growth of social networks and cloud services like Facebook. Politico took a look at some of the things that we still don’t know about PRISM and the activity involved in the NSA’s surveillance program — including how much data the spy agency has been collecting from phone companies as well as tech companies like Google, whether this data collection has actually thwarted any specific terrorist attempts or not (something that is the subject of much debate) and how exactly the PRISM program works in practice. Meanwhile, the Daily Beast has a piece that looks at the group within the U.S. intelligence apparatus that hunt down leakers like Snowden, a kind of internal police force called the Associate Directorate for Security and Counterintelligence — or the Q Group for short. And Salon magazine has a feature and interview with Laura Poitras, the documentary film-maker who was contacted by Snowden and later helped both the Post and the Guardian write their stories about the leak. I can asure all tha Google, etal- can redirect NSA to a locked box. Their technologists along with Zuck’s and others are the best out there. Who do you thinks is pulling on China’s string? And what about the issue of public apathy? That is a huge problem. I’ve been posting about this on Facebook for almost two years, and I have almost 300 friends, and NO ONE responds. In fact, very few people have even responded now that it’s become a big story. However, if I post something about a Golden Girls episode, I will get like 50 responses. This is an enormous problem in fighting against the spy programs. How about a follow-up article on WHY this is so very dangerous, examples of abuses that have already taken place, an explanation of what “chilling effect” means, and other possible ramifications? Thanks, Rebecca — I agree apathy is a huge issue with topics like these. About the methods used for collecting data you might want to ask Richard Bejtlich the owner of taosecurity blog. Thanks, Eric — glad you found it to be useful. usa is becoming society without any privacy. They voted for a black liar as president and don’t even believe that theres climate change happening. Obama is worse than bush. Nothing ever changes. Same old thing and then eventually this country turns into a military dictatorship or totalitarian country. I’m not so sure about that – for example, consider the recent research that showed search engines returning different results for people with Latino or African-American names. In the case of the phone companies, at least, their denials are almost certainly lies. Companies like AT&T have been colluding with the NSA (and their predecessor) since the 1920’s. This is all fully documented in James Bamford’s “Puzzle Palace” (someone borrowed my copy so I can’t give the exact details.) They provided full copies of all telegrams to the NSA, for example. Bamford also discusses (in his other book on the NSA) the fact that they have people working for Cisco so that they have full access to the Cisco OS that runs most of the routers on the Internet. It would only make sense that they also have agents working for all the companies mentioned. It may be that the company management is not aware of the back doors that have been placed there by employees secretly working for the NSA. It’s revealing that the agency says they “try” to work within the law. They do not claim that they *do* operate within the law. They have been breaking the law since their very inception, so it’s no surprise that they are still doing so. Finally, there are many places between your computer or networked device and the destination (Google, FB, etc.) where interception is possible. The NSA undoubtedly has full access to things like the metropolitan area exchanges (e.g. MAE West) through which virtually all traffic passes. While it would be interesting to know exactly how they’re doing it, the fact is that the NSA would have made interception of all Internet traffic its highest priority from the start. Nothing like the law would stand in their way. It never has before. Does anyone remember the MATRIX program? “The MATRIX program was shut down in June 2005 after federal funding was cut in the wake of public concerns over privacy and state surveillance.” (SOURCE: http://en.wikipedia.org/wiki/Hank_Asher). In the aftermath of MATRIX, the federal government continued endorsing the creation of fusion centers in every state. Each state is responsible for gathering its own surveillance data to share with the feds. Some of this intelligence is gathered by unknown private sources, operating within a particular state. (SOURCE: http://www.gpo.gov/fdsys/pkg/GAOREPORTS-GAO-08-35/html/GAOREPORTS-GAO-08-35.htm). My point is that the feds supplement their surveillance effort by delegating some of this work to the individual states. Your state police agency and department of safety are working with local businesses and private contractors to gather intelligence on peaceful individuals and groups within your state. It’s not only the feds who are spying on us anymore. Our counter-terrorism system is like a giant “dragnet” that identifies patterns, and then alerts an agent/operator when something changes. It cannot discriminate between terrorists or other criminals. It’s like my TiVo that records everything 24×7, from multiple channels simultaneously, so when the authorities are late to the game they have a complete recording of an entire event. Learn how to hide from these automated data collectors. NOTE: This is different than hiding from police surveillance since a real person is already following you and you’ve probably done something wrong. * Use cash if you go someplace new. Use cash at toll booths, stow your toll tag. * Use public Wi-Fi. Buy a long range antenna. * Learn how to change your computer’s MAC address and computer name, so Dunkin Donuts or MacDonald can’t track your laptop. Verify it with your home router by listing “attached devices”. * If you use a VPN hosting provider for anonymity, you must know some sh*t so it don’t leak DNS requests. * Have alternate E-mail accounts with different names. * Use a fake name in your Facebook profile. Don’t use your real DOB. Don’t post pictures of your face. Please don’t tag your friends faces. * Cancel Comcast Internet service because they know where you live. * Be aware of who keeps your SSN on file (or driver’s license#): Banks, credit card companies, gas/electric, cable/Internet/telephone, RFID toll tags, airlines, landlords. * Know when it’s legal to give fake identity information; make it believable. How will they verify it? Doo not lie to the police. * Video cameras are everywhere. Wear baseball cap and sunglasses if you go someplace new. * Keep cell phone turned off with battery removed. Need a pre-paid “burner” phone if you travel someplace new? * Being anonymous is becoming harder to do these days because if you don’t provide your true identity information, you are denied goods and services and a place to live. Wasn’t there a similar platform to PRISM operated in the 1970s/80s for legal targets i.e. PROMIS (Prosecutors Management Information System). The only difference being PROMIS harvested and tracked information about anyone who had been of interest to the Justices Dept. The information gathered was bank detail, phone details, financial details, movements etc., etc. One subtle difference between PROMIS and PRISM, it was suggested that PROMIS was obtained from the USA by Mossad (Israeli Intelligence), taken apart then rebuilt with a backdoor. If Gordon Thomas and Martin Dillon’s book about Robert Maxwell – The Assassination of Robert Maxwell – is to be believed then the modified platform was sold to various governments around the globe including the USA’s Sandia facility enabling the Israeli government to harvest information about anything and everything including the then current leading edge technology in the nuclear defence/arms race at the Sandia facility. Surely PRISM is no different PROMIS and what the Israelis did against the US back then apart from now private citizens have ready access to computers which back then was fairly limited. I knew the US was now owned by China, didn’t realise it had actually become China. Fascinating account. It happens that I didn’t have time to read through all the conflicting allegations and denials and put them into a coherent threat, so this article is very helpful. A big operation or institution could be kept secret from the public knowledge for decades in the past. E.g., NSA had existed for half a century being exposed by the media in the late1990’s, and nobody knew about it until then. But nowadays with Internet, information flows so fast keeping that size of secret won’t be that easy any more. Where have you all been. Promis software is where this all started. I’m off now. Almost midnight here in Germany. Is it possible to place a time mark on your updates? This would help following how this story developed. 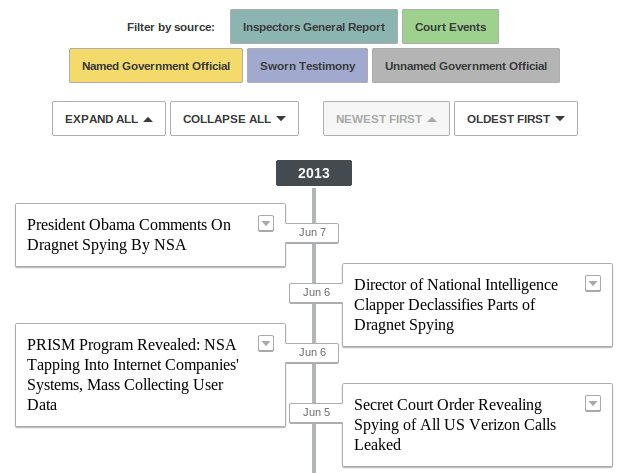 Btw: http://gigaom.com/2013/06/07/nsa-spying-scandal-fallout-expect-big-impact-in-europe-and-elsewhere/ WTF?! I’ve read your Update message right now. Be sure, I pass it further to some campaigns here in Germany. I’m afraid of people not changing/boycotting due to a lack of good alternativs. After all the Guardians purpose to use TOR or VPNs is not that bad. And GPG/PGP encryption might be an idea worth thinking about it, too. Thanks for the attempt to gather related information. I’m trying to do the same, but in German. Thanks, Kathy — I’ve added that to the post. your ISP is a single ENTITY, as are each of those COMPANIES, single ENTITY for FISA target, and yes, all of those single entity companies are communicating with foreign, so yes, anything you send to them goes in! Why blogger and not journalist? Never mind that Greenwald is an Izzy Stone Award for his journalistic achievement and author of three books. I think you’re just blindingly — perhaps inadvertently — following the dismissive NY Times stance, who are trying hard to classify him in a category apart, to strip his work of journalistic validity like some did with Assange. They have a clear purpose in their use of language ,but it’s less clear what is your motivation exactly to follow their lead in that regard. Either this is a disingenuous and less than accurate report from the very start, or a simply poorly researched and not very well-thought out piece attempting to invalidate or minimise Greenwald’s stature as a journalist. Pettiness. This comments system doesn’t allow for edits. Thanks — unlike the New York Times and some others, I don’t see the terms blogger and journalist as being mutually exclusive, especially since I am both as well. I said blogger because that is what he is — and yes, he is also an excellent journalist, but I don’t feel the need to point that out by using the term. Thanks for the comment though.